Thanks to its simple construction, small footprint and excellent facilities for nautical characteristics suitable for complete beginners, with a perfect precursor to more extensive equipment before taking the much more expensive "real" racing sailboats. Kit includes moldings glued to the hull deck, keel ballast, dural mast and boom, finished Dacron sails, rigging, a set of small accessories, sheet of stickers and stand. 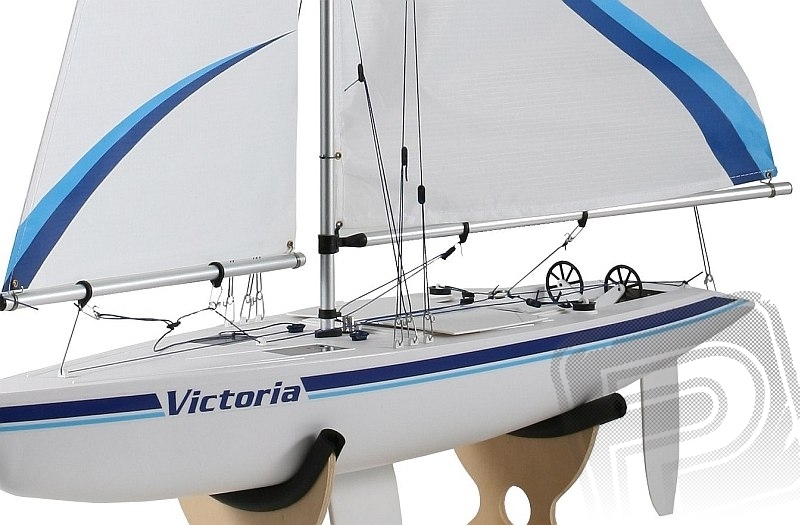 Sailing manufactured by Thunder Tiger form an integrated series of half a meter Aussie suitable for a small pond "Kacak" to the big Voyager with a length of 1000 mm and overall height of 1320 mm. All models have a hull made of plastic molded parts from solid and viscous products, carbon fiber masts or duralumin are removable for easy transport. Dacron sails are supplied ready, kits include all necessary accessories and Scale detail, there is of course the stand. The keel is already supplied with the load, so there is no hunting lead casting of a home shot or old water pipes. For gluing small parts, instant adhesives are suitable for sealing sleeves rudder and other larger parts used epoxy adhesive supplied in the kit or you can use a silicone sealant. Easy access to the RC equipment provide large removable waterproof covers. For smaller models make do with a two-channel radio system with two standard servos, at the Victoria Voyager or if you want to fully take advantage of the ship, it is better to use special sailing servo.